Even before the film opens, controversy surrounds it with the ban in Tamil Nadu. The state has banned the film on the presumption that it would cause trouble with Kerala, the neighbouring state since they feel the story is based on the Mullaperiyar dam for which Tamil Nadu holds lease rights for 999 years. 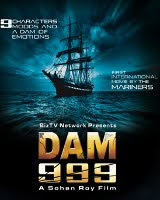 The film deals with the disaster that big dams cause to human settlement and is based on the disaster that struck China when the Banqiao dam burst in 1975 and claimed the lives of almost 2,50,000 victims. It unfolds as a human drama where a marine engineer returns to his native village with his young son, looking for a cure for his diabetes. A single parent, he meets up with his childhood beloved and sparks begin to fly again despite the fact that their relationship is doomed, according to the stars. Meanwhile, evil politician, Aashish Vidyarthi threatens chaos in his constituency by going ahead with the controversial dam project.